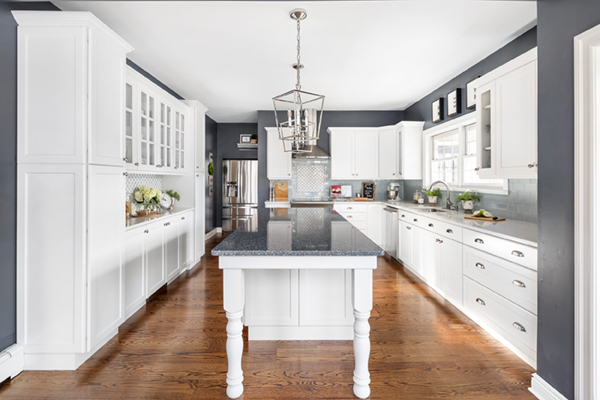 Contrary to popular belief, maintenance-free, or laminate, kitchen cabinet doors are often more durable and more affordable than traditional wooden doors. 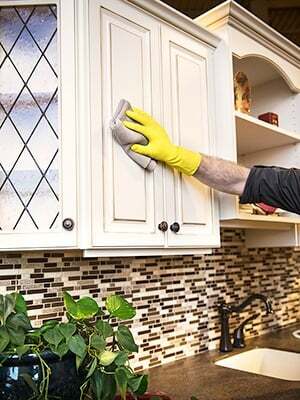 One of the many benefits of maintenance-free cabinet doors is how easy they are to clean and keep looking like new. Please note that the following instructions apply to maintenance free laminate cabinet doors without glaze. To clean glazed doors, please download and follow these instructions. We call our laminate doors maintenance-free for a reason: they’re made to be easy to care for. With maintenance-free cabinet doors, you won’t have to worry about the natural warping or fading overtime that comes with wooden doors, meaning you won’t have to re-stain the doors or re-adjust any hardware. Wood doors are still the popular choice among homeowners, because they offer the beautiful look of natural wood with a steadfast durability. Because each of our wooden cabinet doors is hand stained with the highest quality finish, they also bring a custom look to every kitchen. To keep your wood doors looking like new for years to come, it’s important to routinely wipe them down with a clean, soft cloth. Because your cabinets are used daily, they are open to a lot of dirt and grime from hands opening and closing the doors, and from grease that spills over from the stove. You may wish to purchase a natural wood cleaner to keep your doors clean and healthy. For minor spills and everyday dirt, a simple solution of two parts water to one part mild dish soap will remove the spill. If the stain has been sitting for some time, and you can’t clean it off with soapy water, try making a loose paste with baking soda and water. Let the paste sit on the stain for a minute, and then gently remove with a paper towel or a clean, soft cloth. 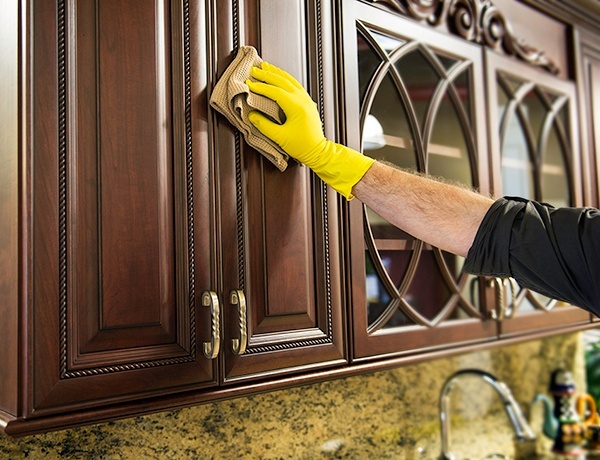 DO NOT use harsh chemical cleaners or scouring pads, because these might damage the surface of your cabinets. For more information on how to care for your maintenance-free cabinet doors, contact your Kitchen Magic kitchen specialist today! Cambria Engineered Quartz Countertops are made from one of the most durable materials on earth, which makes them a great countertop material for the busy homeowner or avid cook. Because Cambria Quartz Countertops are “Maintenance-Free,” they never need polishing or sealing, and remain beautiful and looking like new for years after your new countertop installation. Cambria Quartz is also NSF Certified as safe for use as a food preparation surface, making it as hygienic as stainless steel. Its nonporous surface makes it bacteria resistant—giving mold no place to grow! Cleaning Your Cambria Countertop is Easy! For small spills or simple cleaning, just wet a soft, cotton cloth with clean, warm water and gently clean your countertop. If you’d like some extra help, you can use a mild soap or dish detergent to help lift the stuck-on spill. DO NOT use harsh chemical cleaners with strong alkaline or acid ingredients. Also, do not clean your countertops with anything other than a soft, cotton cloth. Stay away from abrasive sponges that you may use for scrubbing pots and pans. DO NOT place hot pots and dishes on top of your Cambria countertop without a hot plate or trivet underneath the hot item. While Cambria Engineered Quartz is one of the most durable countertop materials on the market today, this does not mean that you should take a hammer to your countertop. Avoid damaging your countertop by taking the necessary precautions, such as using a cutting board while preparing your food with a knife. The information in this how-to guide came from Cambria; please visit their Product Care & Maintenance page for more information. Granite Natural Stone Countertops are made from natural granite, one of the stronger materials found naturally in the earth. Granite Certified by Kitchen Magic is composed of the highest grade naturally occurring Granite, quarried in Italy, Brazil, India and the United States. Like most stone countertops, cleaning up small spills and keeping your Granite Countertops clean requires very little work. Simply use a clean, damp cotton cloth to wipe up any spills, and some mild soap or dish detergent for the tougher stains. DO NOT use harsh chemical cleaners or bleach to clean your Granite Countertops. Formica first developed its high-pressure laminates over nine decades ago, and continues to be the authority when it comes to laminate countertops. Laminates can offer a high-end look at an affordable price, and boast durability and impact-resistant materials. For day-to-day cleaning, a soft, cotton cloth and some soapy water will do the trick. If you couldn’t get to the spill in time, or the stain is a little more stuck-on, you can use a mild household cleaner. Be sure to properly and thoroughly dry the surface with a soft, cotton cloth. If excessive amounts of water are left on the counters, especially near the seams, water can penetrate beneath the surface and cause the countertop to swell. Some of the more stubborn everyday stains may disappear after several cleanings or some time has passed. These can be food stains, coffee and tea stains, water marks, glass rings, food dyes and fingerprints. Other stains such as certain inks, lemon juice, hair dye, peroxide and tannic acid may permanently stain your Formica countertop. While Formica laminates are made to last, you want to avoid excess damage to the surface. Always use a cutting board when preparing food with a knife, and place all hot items under a trivet before placing on your countertop. Sometimes new laminate countertops can have residual glue that causes a streaky appearance on the surface. To remove this contact adhesive, clean with a non-abrasive cotton cloth and an adhesive solvent. Be sure to read all directions and warnings before using an adhesive solvent, or you could do further damage to your Formica countertop. The information in this how-to guide came from Formica Brand Laminate; for more information visit their Use and Care Guide and Warranty page. Silestone Quartz Countertops use one of the most durable materials available on the market today. Because it’s made from one of the hardest materials found in nature, it is stain, scratch, chip and heat resistant. Cleaning small spills is simple when you have Silestone Quartz Countertops. A mild household cleaner, such as Fantastik or Windex and a clean, cotton cloth will clean your messes right up. For stubborn or stuck-on stains, just let the cleaner soak for ten minutes before wiping up with a cotton cloth. DO NOT use harsh commercial chemicals or abrasive sponges and cleaners. For everyday quick care of your countertop, simply wipe down with a clean, dry cotton cloth. That’s really all you need! Microban is an anti-microbial protection that’s built right into the countertop to fight the growth of odor-causing bacteria, mold and mildew on your Quartz countertop’s surface. Although this is not a substitute for regular cleaning, it does make cleaning that much easier, and provide you with peace of mind. Because Silestone Quartz Countertops are durable and come equipped with Microban protection, Silestone will resist scratches, stains and scorches. To keep your countertop looking like new for years to come, DO AVOID excessive force and thermal shock due to placing hot items on your counters. Place hot pots and pans on a trivet first, and use a cutting board for food preparation including a knife. The information in this how-to guide came from Silestone; please visit their Maintenance page for more information. Wilsonart laminate countertops area easy to maintain and offer durability at an affordable price. Although it is stain and impact resistant, it is important to know how to properly clean and care for your Wilsonart laminate countertop. Just like other laminates, Wilsonart countertops are made to be easy to clean and care for. For routine cleaning, a clean cloth or sponge and some warm, soapy water will remove most spills and stains easily. The more stubborn stains, like coffee or tea, can be cleaned up using a mild household cleaner and a soft bristled brush. AVOID harsh commercial cleaners and abrasive scouring pads to remove stains. If a stain is refusing to leave, a paste made from baking soda and water can applied onto your countertop and scrubbed with a soft bristle brush. Be careful not to exert too much force while scrubbing—baking soda is a low abrasive, but can cause permanent damage to your counters. For the most stubborn of stains, household bleach may be used to remove the stain, but be careful, because prolonged exposure can permanently discolor your Wilsonart laminates. Because Wilsonart developed all of its laminate countertops to be durable, they are impact resistant. But you should still take regulatory precautions when using your Wilsonart laminate countertop. Always use a cutting board when preparing food with a knife, and place a trivet underneath any hot items before placing them on your counter. The information in this how-to guide came from Wilsonart; please visit their Care & Maintenance page for more information. Corian is the original solid surface countertop material, created by DuPont over 40 years ago. It is manmade and created by blending together pure acrylic resin with natural minerals. Its grout-free design offers a smooth and seamless look, along with a hassle-free style. Corian solid surface countertops are durable and affordable, making them a wonderful choice for the busy homeowner on a budget. Corian countertops are very easy to clean, and usually need nothing more than a soft, cotton cloth and some warm, soapy water. For the more stuck-on stains and spills, you can use an ammonia-based household cleaner. DO NOT use harsh commercial cleaners, which can damage your counters, or window cleaners, which can leave waxy buildups on the surface. Because Corian has a non-porous surface, it is stain resistant and leaves no place for bacteria and mold to grow underneath its surface. It does not require extra sealing, like Granite or other natural stone materials. This makes caring for your Corian countertop very simple! To occasionally disinfect your counters, wipe down the surface is 1 part bleach and 1 part water. Be sure to fully dry your Corian countertop, so that you do not leave watermarks behind. Although Corian is very durable, avoid excess force that could damage your counters. Use a cutting board when preparing food with a knife, and place all hot items on a trivet before setting down on your countertop. The information in this how-to guide came from DuPont Corian; please visit their page: How to Clean Corian-Guidelines for Long-Lasting Beauty for more information. Zodiaq by Dupont Quartz Countertops are made out of 93% natural Quartz, which is one of the strongest materials found in nature. This makes it the premier choice for countertop materials, offering a countertop surface that is durable, practical and carefree. For routine care, all you need is some water and a paper towel. For tougher stains, you can replace the water with a non-abrasive household cleaner, like Lysol. DO NOT use bleach cleaners, harsh commercial chemicals or abrasive sponges. Because Zodiaq Quartz Countertops are sealed with durability, you don’t have to worry about bacteria or mold finding a nice home underneath your countertop’s surface. Zodiaq Quartz Countertops are durable, but DO NOT allow for excess heat or damage to ruin your countertop. Use a cutting board when you prepare food with a knife and keep a trivet underneath hot items. The information for this how to guide came from Dupont; please visit their How to Clean Quartz Countertops page for more information.